I know you plan loads and loads of parties - I mean, you are TheBashionista! But I just don't know how you keep from getting totally demoralized when we are living in a culture of not RSVPing anymore. I throw parties once in a while and it drives me crazy that an hour before the party starts, I couldn't tell you if 10 people or 40 people are going to walk through the door. I don't care about cleaning and buying food - I'm happy to do it! - but I can't stand having a ton left over and feeling like I wasted a lot of money. Going potluck is one way to solve that problem, but I can't count on people to bring anything vital, because even if they say yes, they could bail at any moment. How do you look at a pile of maybes and estimate how many of them will come? Is it easier to count on people to show up for a weeknight event when there are fewer competing events? Is there any way of letting my friends know how annoyed I am by their indecision without sounding like a complete jerk? This is definitely something I wrestle with. When you go to the trouble to plan something fun for your friends, and spend money getting ready to feed and inebriate them, and they can't expend the energy to hit the Yes, No, or Maybe button on an invitation, it's hard not to feel hurt. But it's important to remember: this says more about them than it says about their feelings for you. Generally speaking, if a person doesn't reply to an invite the second they get it, they probably never will. Since a moment's indecision is all it takes for an email to get buried in a pile of other emails, try not to take your friends' silence personally. In response to your question about days of the week, sadly, no, people are not one bit more reliable on weeknights. I have been throwing a weekly dinner party for the past five years, and generally speaking, I can wake up with a certain number of expected guests and have that number double, triple or quadruple by 5pm. I can also watch it cut itself down by 75%. There's just no telling. I wish there was a magical formula that will reliably predict your headcount, but it would have to take into account A) what your friends are like B) how pumped people are about your particular event and C) what social events/life events/flu seasons you are competing with on a given day. For a rough estimate, I figure on half of the maybes and one third of the people who didn't bother to answer to show up - planning for that number will give me a good safety net of food and drink. Some people use the same large list of people for every event, adding people over time, rarely subtracting. This is fine if you really don't care how many people show up. Since you *do* care, it's important that you trim your guest list into something reasonable. If your guest is one of 100 or more, she'll figure it's less important that she show up. Keep your list to 50 or so and people will know they were hand-picked, and that will make them more likely to respond. And if flakey people seriously get you down, invite fewer of them in the first place; invite your reliable inner sanctum, and add a few long shots who you'd love to see. Don't count on them, and that way you can be pleasantly surprised but not disappointed by them. Once you get down to a mid-size party - anything from 10-30 people - it's crucial that you have an idea of how many will show up. If you're feeding people, you don't want to over- or under-buy; if you're screening a movie or playing a game, you'll need to know they can fit in your living room. For an event like this it's reasonable to send out a kind but firm reminder-email a few days in advance. Let people know you're hoping for a headcount before you head to the grocery store. It's fair to assume that people who don't reply to this follow-up email will not be coming - or if they decide to last-minute, odds are they will show up with beer or food - so you don't need to inclue them in your shopping plan. 3) The Dinner Party - All hands on deck! The one type of party you should not have to be flexible about is a dinner party. Even when I'm throwing a potluck, I do a certain amount of pre-planning - setting each person a place and selecting a placecard. 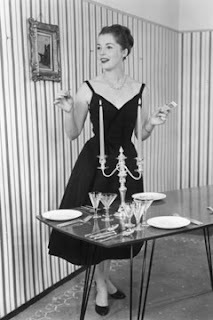 Guests at my supper club know that they need to let me respond by 5pm when I'm setting the table - or they figure it out the first time they show up unannounced and watch me start moving furniture. If it's a meal where I'm doing all the cooking, a couple of days after sending out an evite I will start contacting guests individually, for a headcount and to find out about any allergies.